The Billy the Kid Target Stand is perfect if you need to hold any size shooting target or multiple targets in windy environments. Setup is easy with no tools required. Each base is equipped with a sharp 10-inch stake. Just push the stakes into soft to medium soil to create your base, spaced according to the width of your target or backer. Then insert a 1×2 wood strip into each base to create your frame. Attach your target to the frame and you're ready to shoot. The stand collapses to a minuscule 0.12 square feet for storage and transport to the gun range. It weighs a measly 4.3 pounds. Its small footprint makes it one of the most portable stand designs that is easy to stash when not in use. Using 1×2 wood strips as the framing material contributes many benefits to the overall function of the target stand: they are widely available, cheap to replace, safe to shoot, easy to staple or clamp to, resilient to any caliber of bullet, and light-weight. Try it out for 100 days. If it is not the most functional, portable, and easy to use target stand, return it for a 100 percent refund. The Billy the Kid Stand weighs in at only 4.3 pounds and can be easily carried in one hand. If you are looking for the most compact and portable stand, this is it. Store it under your truck seat—right beside your gun—and you'll always be prepared for a shoot. In optimal soil (soft to medium), the Billy the Kid Target Stand will provide a solid target base. Each base is equipped with a massive 10 inch stake. The stake is cut at a sharp 60-degree angle (with respect to the ground plane) so the point can be easily driven into the ground. We do not recommend hammering the stand directly—you'll muck it up. Instead, insert a 6" 1×2 strip or a ¾ × 1-½ steel bar or tubing. You can then hammer on this buffer without damaging the stand. Depending on soil hardness, a 2–5 pound hammer may be needed. First, insert a 1x2 strip into the auto-brace. This strip will act like your shovel handle. Next, step onto the stand's base like you would a spade shovel and work the stake into the ground. After the stand is anchored 10" into the ground, it will not move no matter how much the wind blows. The 1x2 vertical frame strips will snap before the stand is ripped from the ground. If this happens, it is time to pack it up and seek shelter. When properly staked, the Billy the Kid Stand will always out perform a surface-mount stand in high wind. The only caveat is that optimal soil density is required. But that is usually not a problem unless you are shooting in a rock pit. 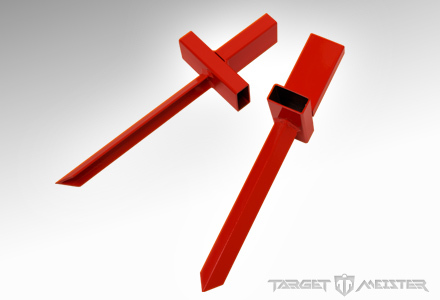 If staked in soft soil, the frame may not be rigid enough to hold a large target or set of targets. Increasing the stand's stance may add stability. Simply slide a 1x2 strips through one or both bases. Additionally, you could stake or weight these extender strips as well for maximum stability. Now you have your target base anchored 10 inches into the Earth—and it isn't going anywhere. But that won't do you any good if your vertical wood frame on top of your base is flopping around in the wind. A bullseye that is swaying left and right is not conducive to precision shooting. This is where the Auto-Brace will save you frustration and time. It was designed by Target Meister. We make it standard on all of our steel stands because it is a huge improvement over other designs. If you're shooting from the hip, maybe you won't care. But Auto-Braces are a must-have for shooters who do not want their targets to move; especially competition shooters. When testing your shotgun's pattern, it is often ideal to use a large target backing. When using a single large backer, multiple "spread" shots from varying distances can be quickly compared. The Billy the Kid Target Stand is ideal for holding a large backer for shotgun pattern testing. Understanding your shotgun's pattern is an informative video demonstrating patterning at several distances using 00 buckshot. The close-range distances and large shot used in the demo pertain mostly to self-defense situations. Testing patterns using bird shot at 50 yards would require a much larger target.